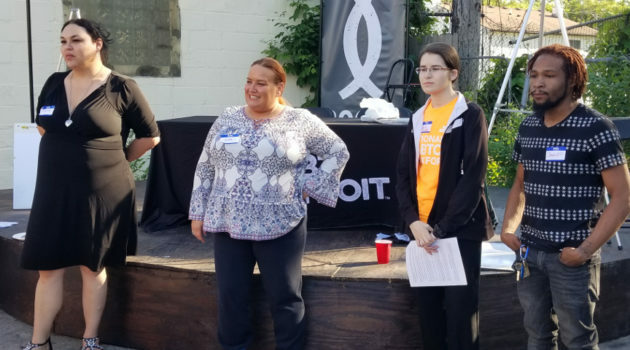 The first meeting of the Creating Change 2019 Host Committee took place Monday, June 11, in the outdoor courtyard of LGBT Detroit. The four co-chairs of the Host Committee were introduced to the crowd of about 50 potential volunteers who showed up to learn more about the LGBTQ-centered conference. Bridie Johnson is a licensed social worker currently working as the clinical supervisor for the Behavioral Health Department of American Indian Health and Family Services in Detroit. She has previously worked as the director of programs for Ruth Ellis Center and conducted research for the I Am for Survivors Project, an initiative focused on increasing visibility in Michigan for LGBT survivors of domestic and sexual violence needing safe shelter spaces. Cara Mitrano is a senior undergraduate student at Wayne State University and one of the host committee members. She has been involved in LGBTQ activism since starting a Gay-Straight Alliance in her high school. At Wayne State, Mitrano founded the LGBT Student Advisory Board. Mitrano could not be reached for comment at press time. 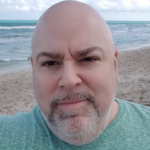 David Nelson, Jr. serves as the Linkage to Care Specialist for Unified HIV Health and Beyond and is a member of the Southeast Michigan HIV/AIDS Council. He is another host committee member and is also a former member of the Hotter Than July – Detroit Black Gay Pride planning committee that oversaw the planning of the Palmer Park picnic and the Annual Gathering on LGBT Issues in past years. The final co-chair is Affirmations Interim Executive Director Lilianna Reyes. In addition to her work at Affirmations, Reyes has worked with many state and national civil rights organizations including Planned Parenthood, the Detroit Police Chief’s LGBT Advisory Council and Transgender Michigan. She is also a founding mother of the Trans Sistas of Color Project. At the meetings, co-chairs posted large sheets of white paper where volunteers could sign up for one or more of the 16 conference sub-committees. The sub-committees include Development and Fundraising, Local Promotion and Outreach, Volunteers, Programming, Communication, Marketing and Branding, On-Site Testing, Youth Hospitality Suite, Elders Hospitality Suite, People of Color Hospitality Suite, Transgender Hospitality Suite, People with Disabilities Hospitality Suite, Bisexual Hospitality Suite, Community Housing, Local Hospitality and Information, 12-Step/Recovery and Spiritual Needs. Interested volunteers can still sign up to be a part of the Creating Change 2019 sub-committee. The Host-Committee will meet monthly with sub-committees meeting in between. There has not yet been a date set for the next Host Committee meeting, however, as the co-chairs look for a meeting space big enough to handle the crowds they anticipate. For more information, you can sign up for conference updates at creatingchange.org or visit the Host Committee’s Facebook page online at gaybe.am/0R.